Chinese New Year is just around the corner and one of the commonly seen symbols associated with CNY is the Three Lucky Stars. These three very distinguishable gentlemen are seen on red packets, New Year cards, wall decorations and decorative statues and even on joss paper. There are many versions on the origin and representations of these Three Lucky Stars. Another belief is that they are reincarnated spirits and are represented by the three stars on Orion’s Belt. Remember Men In Black and the phrase “the Galaxy is on Orion’s Belt”? Well, there are no galaxies on his belt, but those are the Three Lucky Stars. 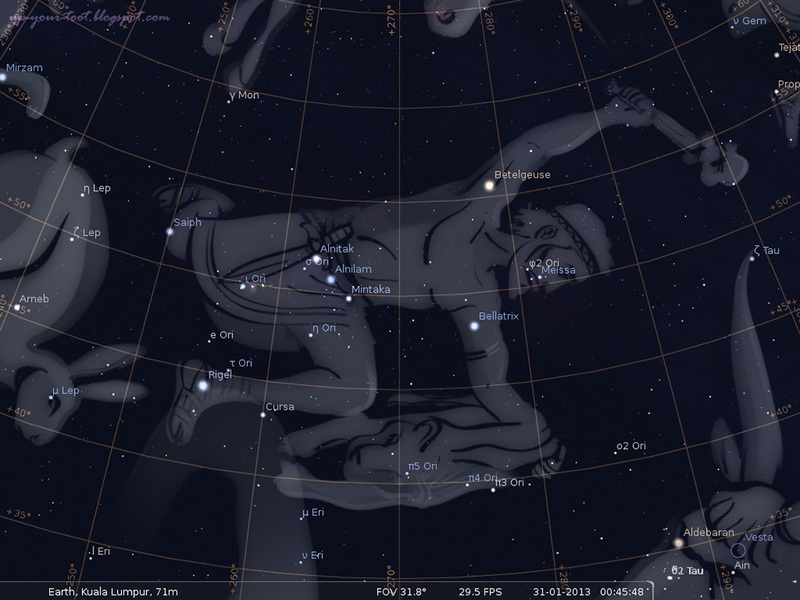 Stellarium rendition of Orion. The three stars of the belt are Alnitak, Alnilam and Mintaka. Notice that the red giant star Betelgeuse is on his armpit. The constellation of Orion is one of the constellations that make up the Winter Circle or Winter Hexagon. The vertices of this Winter Hexagon/Circle are made by the stars Rigel (in Orion), Sirius (Canis Major), Procyon (Canis Minor), Castor or Pollux (Gemini), Capella (Auriga) and Aldebaran (Taurus). The Winter Circle/Hexagon. The red arrow from the Three Lucky Stars (Orion's Belt) points to Aldebaran whilst the yellow arrow points towards Sirius. Hence the Belt can help you locate these two other stars. This asterism of stars becomes prominent during the winter months, from December to early March in the Northern Hemisphere. The hexagon encircles the Red Giant star Betelgeuse of Orion. The smaller, Winter Triangle has its vertices made up from Betelgeuse, Procyon and Sirius. 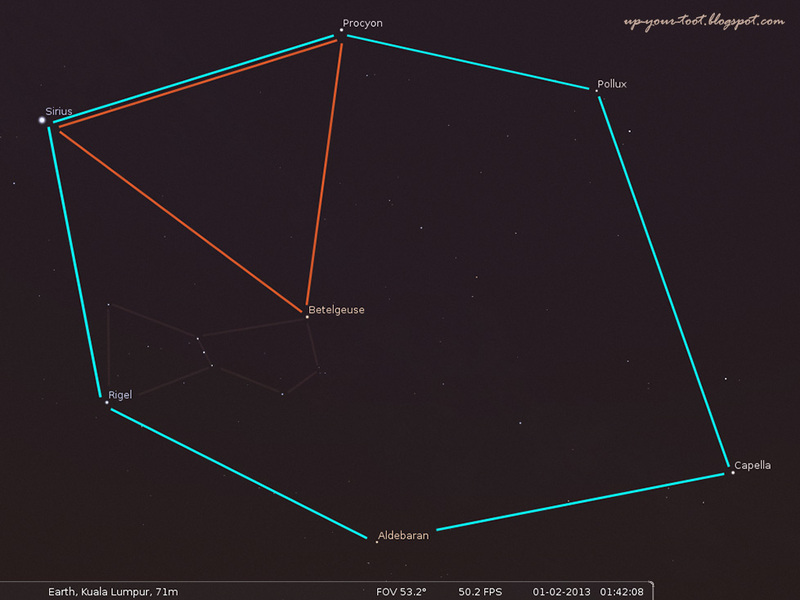 Another Stellarium rendition of the Winter Circle/Hexagon (in blue/cyan) and the Winter Triangle (in red) . 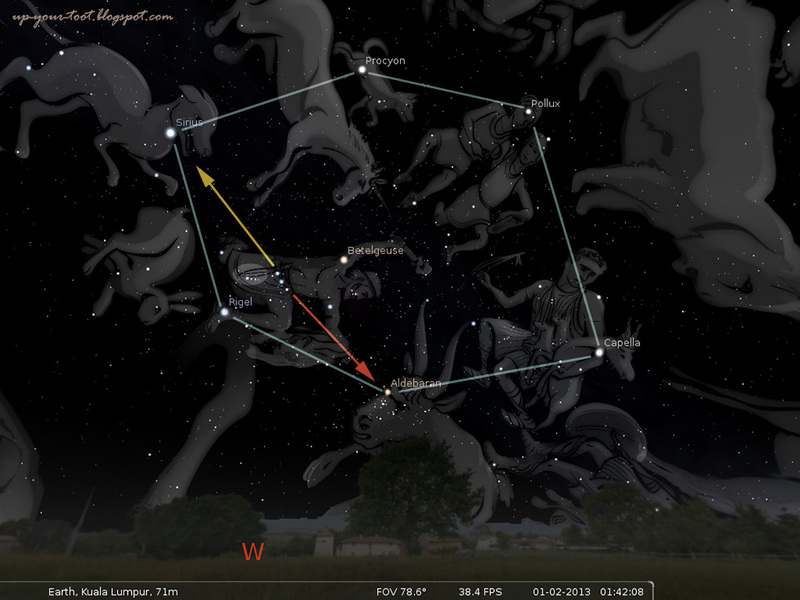 The Winter Triangle consist of Sirius, Procyon and Betelgeuse, with the vertex point of Betelgeuse pointing to Aldebaran. Back to Orion, or rather Orion’s Belt; the constellation appears to rise and set earlier as the months move from December to March. It is said that in China, the Belt appears to reach its highest position in the sky near midnight around the eve of Chinese New Year, (最高點), thus heralding the arrival of a new year. Note the sword of Orion - another group of stars in a somewhat straight line that lies somewhat perpendicular and below the belt. Orion as viewed almost overhead from Ampang, Selangor. The three stars of the belt can be easily seen together with Rigel (blue-white in colour) and Betelgeuse (reddish-yellow). Also visible is the 'sword' of Orion. 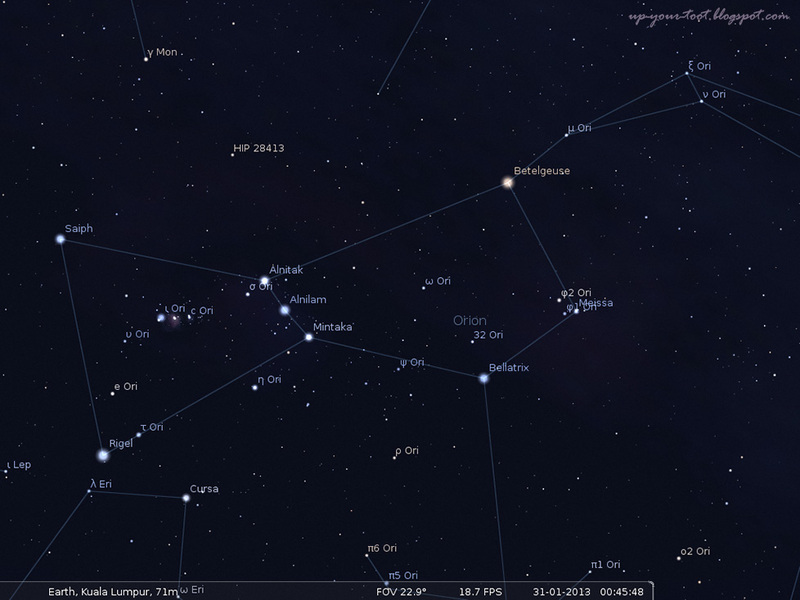 Compare this picture with the one above it (rendition from Stellarium) can help you find the stars. Some believe that the practice of welcoming the Wealth God on New Year’s Day is actually the practice of welcoming the Three Lucky Stars (福禄寿) or Orion's Belt. As monetary gains becomes the focus of the practitioners, the two other lucky stars were omitted from the invitation practice. 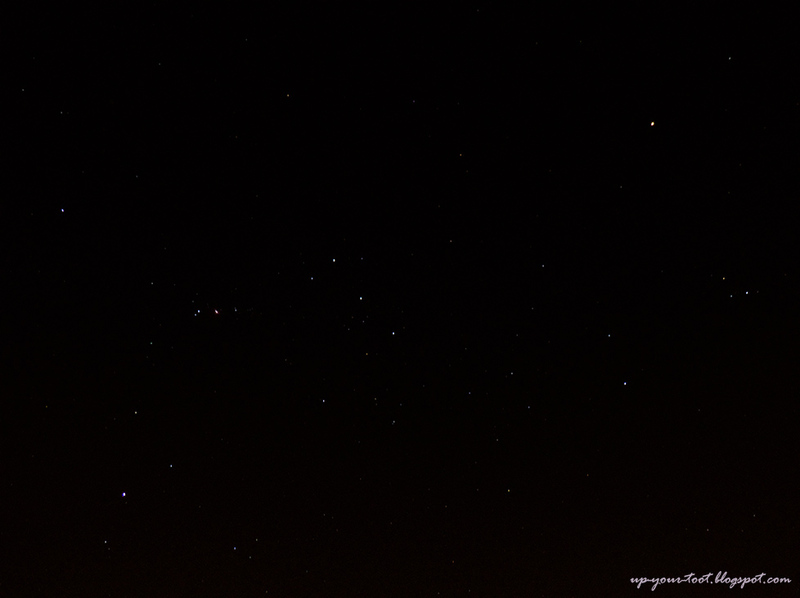 Can you see Orion or Orion's belt on this photo? The belt is on the middle top part of the photo. Look at the photo below to compare. 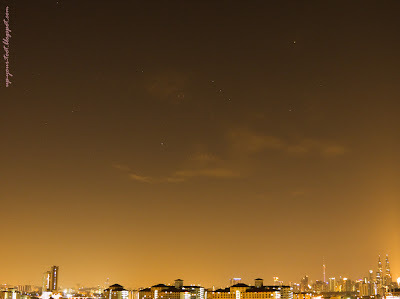 The view of Orion over the bright lights of KL city skyline with the three stars highlighted This is when Orion is setting in the West. Rigel, Betelgeuse, the sword, and even Aldebaran can be seen despite the high light pollution on the skyline. These three stars can be easily spotted with the naked eye, together with the rest of the stars on Orion on a clear night during the boreal winter months. Even the bright lights of KL city cannot mask the stars as they set in the West, early in the morning. So take a look and see if you can see the Three Lucky Stars for the New Year. Happy Chinese New Year!